Azure operates in multiple datacenters around the world. These datacenters are grouped in to geographic regions, giving you flexibility in choosing where to build your applications. It is important to understand how and where your virtual machines (VMs) operate in Azure, along with your options to maximize performance, availability, and redundancy. This article provides you with an overview of the availability and redundancy features of Azure. You create Azure resources in defined geographic regions like 'West US', 'North Europe', or 'Southeast Asia'. You can review the list of regions and their locations. Within each region, multiple datacenters exist to provide for redundancy and availability. This approach gives you flexibility as you design applications to create VMs closest to your users and to meet any legal, compliance, or tax purposes. A physical and logical network-isolated instance of Azure for US government agencies and partners, operated by screened US persons. Includes additional compliance certifications such as FedRAMP and DISA. Read more about Azure Government. These regions are available through a unique partnership between Microsoft and 21Vianet, whereby Microsoft does not directly maintain the datacenters. See more about Microsoft Azure in China. These regions are available via a data trustee model whereby customer data remains in Germany under control of T-Systems, a Deutsche Telekom company, acting as the German data trustee. In the event of a wider Azure outage, one region is prioritized out of every pair to help reduce the time to restore for applications. Planned Azure updates are rolled out to paired regions one at a time to minimize downtime and risk of application outage. Data continues to reside within the same geography as its pair (except for Brazil South) for tax and law enforcement jurisdiction purposes. You can see the full list of regional pairs here. Some services or VM features are only available in certain regions, such as specific VM sizes or storage types. There are also some global Azure services that do not require you to select a particular region, such as Azure Active Directory, Traffic Manager, or Azure DNS. To assist you in designing your application environment, you can check the availability of Azure services across each region. You can also programmatically query the supported VM sizes and restrictions in each region. Understanding Azure regions and geographies becomes important when you consider the available storage replication options. Depending on the storage type, you have different replication options. Replicates your data three times within the region in which you created your storage account. Replicates your data three times across two to three facilities, either within a single region or across two regions. Replicates your data to a secondary region that is hundreds of miles away from the primary region. Replicates your data to a secondary region, as with GRS, but also then provides read-only access to the data in the secondary location. You can read more about Azure Storage replication options here. 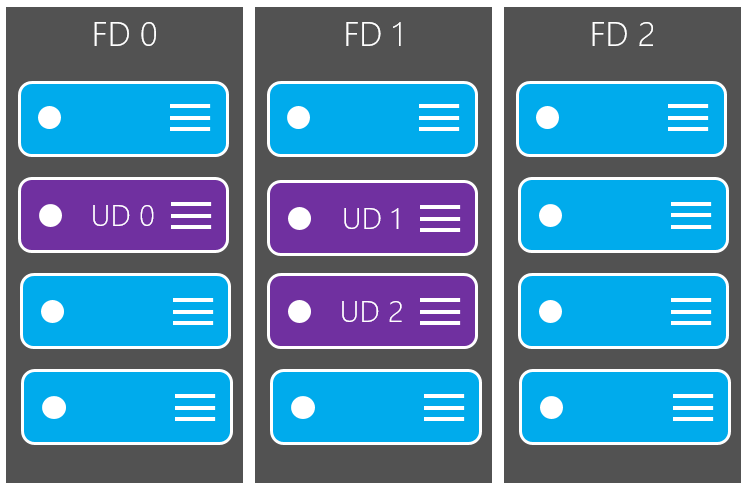 For more information about managed disks, see Azure Managed Disks overview. Prices vary depending on the storage type and availability that you select. Premium Managed Disks are backed by Solid-State Drives (SSDs) and Standard Managed Disks are backed by regular spinning disks. Both Premium and Standard Managed Disks are charged based on the provisioned capacity for the disk. Premium storage is backed by Solid-State Drives (SSDs) and is charged based on the capacity of the disk. Standard storage is backed by regular spinning disks and is charged based on the in-use capacity and desired storage availability. For RA-GRS, there is an additional Geo-Replication Data Transfer charge for the bandwidth of replicating that data to another Azure region. See Azure Storage Pricing for pricing information on the different storage types and availability options. An availability set is a logical grouping of VMs within a datacenter that allows Azure to understand how your application is built to provide for redundancy and availability. We recommended that two or more VMs are created within an availability set to provide for a highly available application and to meet the 99.95% Azure SLA. There is no cost for the Availability Set itself, you only pay for each VM instance that you create. When a single VM is using Azure premium SSDs, the Azure SLA applies for unplanned maintenance events. An availability set is composed of two additional groupings that protect against hardware failures and allow updates to safely be applied - fault domains (FDs) and update domains (UDs). You can read more about how to manage the availability of Linux VMs or Windows VMs. A fault domain is a logical group of underlying hardware that share a common power source and network switch, similar to a rack within an on-premises datacenter. As you create VMs within an availability set, the Azure platform automatically distributes your VMs across these fault domains. This approach limits the impact of potential physical hardware failures, network outages, or power interruptions. An update domain is a logical group of underlying hardware that can undergo maintenance or be rebooted at the same time. As you create VMs within an availability set, the Azure platform automatically distributes your VMs across these update domains. This approach ensures that at least one instance of your application always remains running as the Azure platform undergoes periodic maintenance. The order of update domains being rebooted may not proceed sequentially during planned maintenance, but only one update domain is rebooted at a time. For VMs using Azure Managed Disks, VMs are aligned with managed disk fault domains when using a managed availability set. This alignment ensures that all the managed disks attached to a VM are within the same managed disk fault domain. Only VMs with managed disks can be created in a managed availability set. The number of managed disk fault domains varies by region - either two or three managed disk fault domains per region. You can read more about these managed disk fault domains for Linux VMs or Windows VMs. Availability zones, an alternative to availability sets, expand the level of control you have to maintain the availability of the applications and data on your VMs. 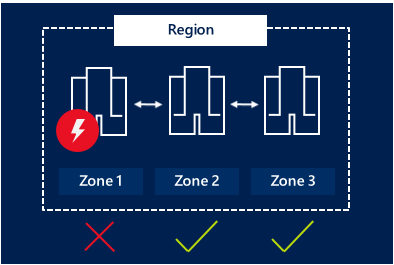 An Availability Zone is a physically separate zone within an Azure region. There are three Availability Zones per supported Azure region. Each Availability Zone has a distinct power source, network, and cooling. By architecting your solutions to use replicated VMs in zones, you can protect your apps and data from the loss of a datacenter. If one zone is compromised, then replicated apps and data are instantly available in another zone. You can now start to use these availability and redundancy features to build your Azure environment. For best practices information, see Azure availability best practices.